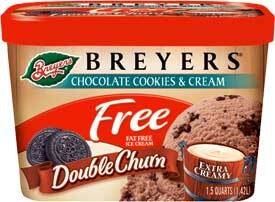 So, a container of Breyer's Double Churn Fat Free Cookies & Creme makes up the last part of my first ever foray into sampling free ice cream. Unfortunately, it didn't end well. The chocolate ice cream isn't bad at all, though it is a bit too chocolaty, maybe 10-15% too much cocoa. Sure the texture wasn't perfect, but considering there is no fat, it's pretty good. Plus, there's no strange aftertaste. No, the real problem is the cookie bits, but in Breyer's defense, I'm wondering if this came about because how the ice cream was shipped. There are no giant cookie pieces in this ice cream, instead, they've been through a heavy duty blender which results in tiny cookie slices that are scattered throughout the ice cream. Unfortunately, many of these tiny pieces are quite hard and unpleasant to bite into. To be fair, I'm not going to pick on Breyer's just yet. A normal freezer sits around 0 degrees, while dry ice the ice cream shipped with is at a much lower at -100 degrees (both Fahrenheit). I think there is a real possibility that the dry ice damaged the cookies, because they aren't all bad. If anyone has tried this ice cream, post a comment and let us know how it was.